Grafting has been practiced to overcome yield problems associated to soil-borne diseases or declines in production. Usually this agricultural method involves the choice of better stock and scion species, procedures to improve the graft union and subsequent healing, and acclimation of the grafted plant to soil. 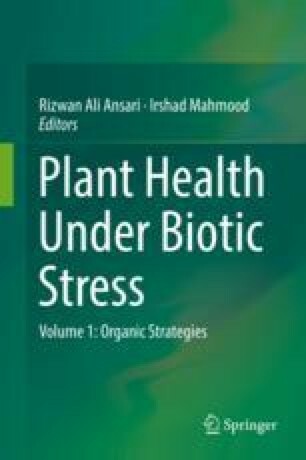 Similarly, to agrochemicals used in vegetable production, this method may induce changes in oxidative enzymes production by plants and consequently provide a higher resistance to biotic stresses. Microorganisms are one of the major concerns in agricultural practices, mainly by its increasing resistance to chemical products regularly applied in cultures. Nevertheless, the association of grafting methods to agrochemicals usage is a wide field of study that should be better interpreted by considering not only the resulting production, but their interactions and consequences in the plant metabolism. The purpose of this chapter is to review the resistance induced in plants by grafting methods or agrochemicals. In addition, the role of oxidative enzymes produced for resistance mechanisms is discussed. Ansari, R. A., & Mahmood, I. (2017). Optimization of organic and bio-organic fertilizers on soil properties and growth of pigeon pea. Scientia Horticulturae, 226, 1–9. https://doi.org/10.1016/j.scienta.2017.07.033. FRAC. (2014). Mechanisms of fungicide resistance. In Fungicide Resistance Action Committee. http://www.frac.info/resistance-overview/mechanisms-of-fungicide-resistance. FRAC. (2017). Fungicide resistance action committee. In: SDHI Fungicide. http://www.frac.info/working-group/sdhi-fungicides. Jung, H. W., Tschaplinski, T. J., Wang, L., et al. (2009) Priming in systemic plant immunity. Science (80-), 324, 89–91. https://doi.org/10.1126/science.1170025$\$r324/5923/89 [pii]. Zhang, Q., Wang, C., Yong, D., et al. (2014). Induction of resistance mediated by an attenuated strain of valsa mali var. mali using pathogen-apple callus interaction system. Scientific World Journal, 1–10. https://doi.org/10.1155/2014/201382.